The expectation of effective and efficient governance in a society is fulfilled through the enactment of binding rules, mapping out of policies and giving of direction to societal activities and the enforcement of the rules to ensure compliance. Thus, governmental functions are performed by a tripartite political and administrative institutional arrangement of rulemaking, implementation and adjudication. The legislature as the primary institution for making law is fundamental to democratic governance. This is because acts of the legislature are the embodiment of people’s will transferred into the will of the state through a transparent system of political comprise of different social and political interests in a society. In this regards, the core of legislative responsibility is the making of law for the peace, order and good governance of the society. This noble responsibility is, in Nigeria’s Fourth Republic, vested in the National Assembly empowered to make laws for the federation or any part thereof. 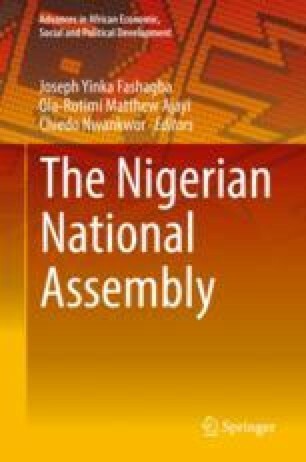 This study interrogates the extent to which the National Assembly has been able to perform its constitutional role of law-making for the Nigerian State. The study reveals how this federal law-making institution has metamorphosed from being a nominal and peripheral to an active partner in governance with consequences for the political stability and development in Nigeria’s Fourth Republic. It also unveils the mutually reinforcing socioeconomic and political factors of the Nigerian state which continues to restrain its effective functioning and which has also desecrated the Assembly from being hallowed chamber. Uche, E. (2011). 6th Senate Passed 91 Bills in Four Years. The Nigerian Voice. Retrieved from https://thenigerianvoice.com/news/53079/6th-senate-passed-91-bills-in-four-years.html on the 21st of November 2018.